A young family with three children asked Powerhouse Company and RAU to design a house that would fulfill their dreams: a paradox of a house that is simple yet surprising, open yet specific, minimal yet luxurious. Powerhouse Company, responsible for the design, resolved these contradictions with a house based on a radical differentiation of spatial experiences on three floors (of which one is subterranean). RAU embedded the sustainable strategy for the villa in the design. Three clear levels, with three very different characters and functionalities as a basis for family life to emerge. One level is for living, a generously open ground floor. A strip of serving rooms containing storage, toilets and stairs, provides easily access to the luxuriously open living spaces. The kitchen and living room are oriented maximally to the sun and view. In close relation to this living area there are two studies located on the north side next to the entrance. The collection of rooms on the first floor provides space for sleeping and privacy. Set in a delicate roof garden, all the bedrooms are autonomous volumes crafted in their entirety from dark wood. They work like a village of cabins, providing intimacy and privacy. Every room is like a world of its own with private views over the wooded landscape. The curved basement is for guests, wellness and storage. The excavations allow the pool and the guest rooms to have fully glazed facades and direct access to the garden. The house incorporates innovative sustainable measures including a hot and cold-water storage and extensive use of hidden PV cells. The basement contains a dedicated area for the high-end energy saving installations. A house designed for the hectic life of an evolving family; fragmented yet united, plural yet whole. The audacious structural engineer Gilbert van der Lee, also responsible for engineering Villa 1, designed the structure, including the soaring ceiling of the living room. The interior furnishings are designed by interior designer Bart Vos. 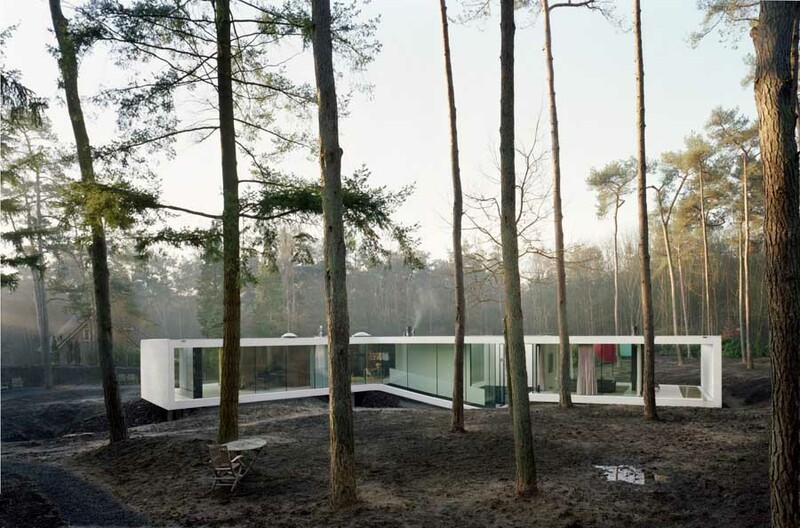 European Union Prize for Contemporary Architecture – Mies van der Rohe Award 2013. Charles Bessard (1970, France) and Nanne de Ru (1976, The Netherlands) founded Powerhouse Company in 2005. Powerhouse Company has offices in Rotterdam, the Netherlands, and Copenhagen, Denmark and works on various international commissions that range from furniture design to architecture, planning and research. Thomas Rau (1960, Germany) founded RAU in 1992 which is located in Amsterdam. 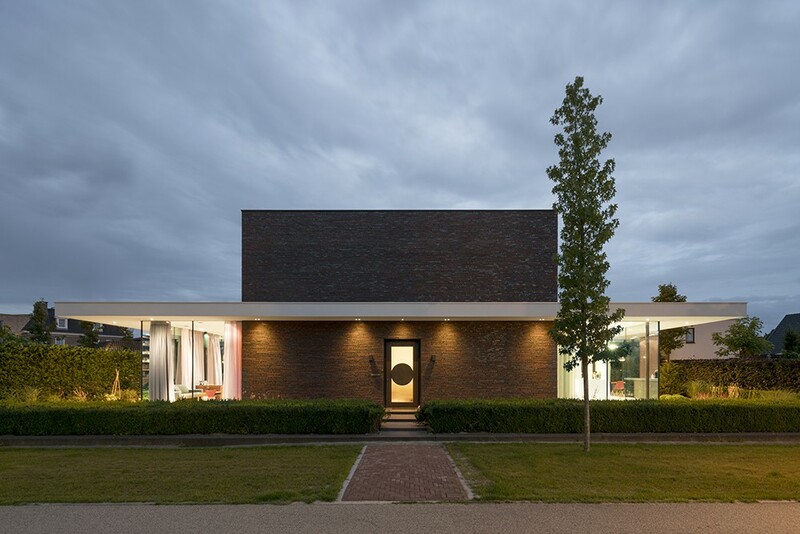 RAU designs buildings with a strong emphasis on sustainability and has been at the forefront of Dutch/European sustainable architecture since its founding. A young family with three kids wants a house that will fulfill their dreams: a paradox of a house that is simple yet surprising, open yet specific, minimal yet luxurious. We resolved these paradoxed with a design for a house that is based on a radical differentiation of spatial experiences three floors (one subteranean), the maximum buildable envelope on this site. Three clear levels, with three very different characters and functionalities as a container for family life to emerge. One level is for living: the generously open ground floor. A strip of serving rooms (storage, toilets, stairs etc.) provide an easily accessible infrastructure for the luxuriously open living spaces (kitchen and living room) that are oriented maximally to the sun and view. In close relation to this living area there are two studies located on the north shield next to the entrance. One level is for sleeping and privacy: a collection of rooms on the first floor. Set in a shallow pond of water that reflects the beautiful forest light, all the bedrooms are autonomous volumes crafted comprehensively of a selection of gorgeous woods. They work like a village of cabins, providing intimacy and privacy. Every room is like a world of its own with splendid views over the woody landscape. One level is for guests, storage and wellness: a curved basement. Thanks to large excavations, the pool and the guest rooms have fully glazed façades and direct access to the gardens. A house designed for the hectic life of an evolving family – united yet fragmented, plural yet whole.